Burnley FC Women’s coach Matt Bee admits it would be very short-sighted of the club to ignore the carrot dangling in front of them. The Clarets’ aspirations in the FA National League Division One North have changed somewhat since the start of the season, when survival and stability had been outlined as the key goal. 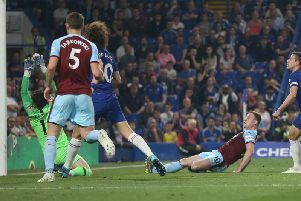 However, Burnley hold a 10-point advantage at the top of the table with just seven games of the campaign remaining and Bee is targeting a second title in succession. After winning 12 of their 15 outings so far, scoring 22 times and conceding just six, he said: “We’ve been in good form. We’re just trying to stay grounded and take things one game at a time. “Our form hasn’t taken us by surprise because we’ve always had belief in what we can do. That’s an ethos that runs through all aspects of the club. We are ambitious and we want to be the best we can be. “We were realistic coming in to this, we knew it was going to be tough after being promoted. We knew the opposition would be stronger and the margins would be much tighter. Bee, who received the Manager of the Month gong for November, added: “We’ve got a bit of a cushion at the moment but teams have got games in hand. It’s not as big a margin as what it appears. “The last seven games are going to be massive for us and each and every one of them will be tough. We’ll have to stay focussed. “Winning the title has to be our aim now. We’ve had to re-adjust our focus. The target at the beginning of the season was to stabalise but now we’re in this position we’ve got to look at it seriously. Burnley’s 10-match winning streak was ended last week when Kelly Halligan’s 85th minute strike secured the points for Bolton Wanderers Ladies at the Ruby Civil Arena. But they’ll be looking to bounce back at the first time of asking when they travel to the Teesside Sports Complex to take on Norton and Stockton Ancients Ladies on Sunday. “We’ve taken some teams by surprise but it’s a test of consistency for us now,” said Bee. “We’ve taken a knock but we’ll look to bounce back and not let it affect us mentally. “The defeat against Bolton won’t detract from what’s been a fantastic season so far and a superb couple of years for the club. Another three points would be another huge step towards promotion, where the likes of Fylde Ladies, Sunderland AFC Ladies and Blackburn Rovers await them in the Premier Division. Burnley were beaten 3-0 by their local rivals in the semi-final of the Lancashire FA Women’s Challenge Cup last month with Lagan Makin, Natasha Flint and Alexandra Taylor grabbing the goals for the visitors at the Arbories. And Bee believes that was a real eye-opener for his players. “We’ve had some tough games since Christmas, no more so than the Blackburn Rovers game in the cup. “That gave us a good chance to see what the standard was like in the division above. It was an eye-opener for the players. It showed us what is required at that level and what we need to get better at. He added: “We’ll have to work hard again and make sure that we’re in the best possible position. “We’ll need to recruit well and have a good pre-season. I’ve not even started thinking about it yet though. I’m not looking past the Norton game. “We’ll get a clearer impression come April and that’s when we’ll start looking at how we can prepare. We’ve just got to get across the finish line first.